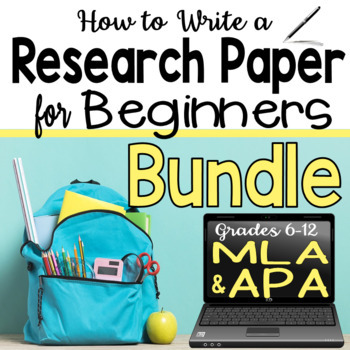 Research Paper Bundle has both my APA and MLA units! Teach the research paper in either or both formats from start to finish! This could also be used to compare the two formats since different teachers prefer different formats. **UPDATED TO 8TH EDITION MLA. Research Paper for Beginners - APA. ❤REVISED TO THE 8TH EDITION for MLA unit. This unit comes with 2 separate lesson packs for both MLA and APA. ► One tackles the topic of multitasking. I have selected websites to use so that teachers can limit sources in order to better check for plagiarism and make sure the Works Cited (MLA) and References (APA) and documentation are correct without having to look up a million different sites chosen by students. Some of the sites support multitasking while others do not, but students choose those relevant to one of the five topic choices given in the lesson. This unit does not teach how to do long quotations or how to cite multiple works by the same author because those topics do not come up in this beginner’s research paper. A student outline is not used in this unit because the beginning paper is short, and this process makes it so easy that an outline is not needed. Of course, you may add those details if you wish. ► The second pack is the same as the above, except it is geared towards a general topic that the students or you decide. BOTH ARE THE SAME UNIT ADJUSTED FOR APA & MLA.